ProCalV5 is a full-featured calibration system that can help even the smallest business with compliance requirements to fulfill them. It has record management features that are aligned with strict regulatory standards to help you satisfy policies dictated in different frameworks. With ProCalV5, your personnel can be more productive due to the user-friendly interface and intelligent workflows. On top of that, they have access to advanced math functions to help them perform calculations swiftly. Moreover, you can gain in-depth and accurate insights into your operations with the help of ProCalV5. The software has powerful reporting and analytics functions for you to review daily work activities and possible management oversights. Calibrations you perform with ProCalV5 are highly detailed. Because it is designed to give you drilled-down information, you have access to a solution with a comprehensive quality management platform. As such, you can rest assured that your operations and your organization are compliant with every version of the framework you follow. ProCalV5 is equipped with numerous standard and custom reports. This feature set allows you to generate data for different things such as the tasks that your personnel performed, completed, or left unfinished for the day as well as management errors. With these reports within easy reach, you can act on issues before they have a big impact on your operations. Papers are almost a thing of the past, even in industries that have held on to them. To further help you move forward, ProCalV5 provides you with technologies that make your calibration practices paperless. It starts with enabling you and your workers to perform calibration tasks even when the Wi-Fi is unavailable. Despite the absence of an internet connection, your employees are still able to maximize working hours for their tasks because of the mobile workstations offered by the solution as it mimics the interface of the desktop version. If you prefer a cloud-hosted calibration system, ProCalV5 is able to provide you with it via ProCal Direct. 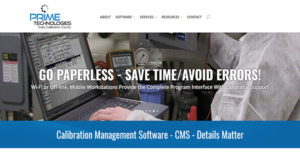 The service allows you to access your calibration and maintenance management programs in the cloud. This is especially beneficial to you if you have multiple sites scattered in distant locations for you to keep a pulse on activities. If you are considering ProCalV5 it might also be beneficial to examine other subcategories of Best Compliance Management Software listed in our database of SaaS software reviews. Every organization has different needs and requires an application that can be customized for their size, type of employees and buyers, and the specific industry they are in. For these reasons, no software can offer perfect functionality out-of-the-box. When you look for a software product, first be sure what you require it for. Read some ProCalV5 reviews and ask yourself do you want basic tools or do you want sophisticated tools? Are there any industry-specific functionalities that you are looking for? Get the answers to these queries to assist your search. There are multiple aspects that you need to mull over and these include your finances, specific business needs, your company size, integration needs etc. Take your time, check out a few free trials, and finally choose the app that provides all that you need to improve your firm efficiency and productivity. How Much Does ProCalV5 Cost? ProCalV5 has one flexible enterprise pricing that starts at $3,000.00, an amount to be paid one time. We realize that when you make a decision to buy Compliance Management Software it’s important not only to see how experts evaluate it in their reviews, but also to find out if the real people and companies that buy it are actually satisfied with the product. That’s why we’ve created our behavior-based Customer Satisfaction Algorithm™ that gathers customer reviews, comments and ProCalV5 reviews across a wide range of social media sites. The data is then presented in an easy to digest form showing how many people had positive and negative experience with ProCalV5. With that information at hand you should be equipped to make an informed buying decision that you won’t regret. What are ProCalV5 pricing details? What integrations are available for ProCalV5? To learn more about integrations, visit the website for the documentation or request additional information from the support team.